From May 2nd to 5th, 2017 about 80 representatives of more than 40 patient organizations from 20 different countries came together in Montreal for this year’s Annual Meeting of the World Pancreatic Cancer Coalition (WPCC). Dr. Steinbeck and I started our journey to Montreal to participate in the meeting on Monday, May 1st. After having taken the train from Stuttgart to Frankfurt, a seven-hour flight brought us directly to Montreal. After we had finally landed and had picked up our luggage, it took us another hour to get to the hotel, where we arrived at 2pm local time. The trip had been exhausting, but we did not feel sleep yet, so we decided to quickly stop by the shopping mall in the basement of our hotel. Around 8pm, we went to bed and fell asleep immediately. Montreal welcomed us with nice weather, so on Tuesday we did a little sightseeing tour, which started at the town’s historic district before we walked towards the harbor. What a beautiful city Montreal is! It was very impressive what we were able to see during only a couple of hours. What struck us most was the way of the local people – everybody was extremely friendly. It felt like everybody was happy to see us and felt glad that we had come. At 5pm all attendees of the meeting came together in the lobby of the hotel. What a big hello it was after one year! We were immediately pulled into the middle of everything again and it felt like we had already known each other for years. From watching the crowd, one could even think that the last meeting had taken place only a week ago or so, but for most participants it actually had been at least a year since they last met each other in person. After the reception a bus brought us to a hospital in Montreal, where a public awareness day took place. People with pancreatic cancer talked about their disease and shared their experiences and physicians provided information on different treatment options and therapies. Among others, topics like gene and immunotherapies were discussed. Overall, the event was quite similar to what we do in Germany during our patient information days. But it made evident again: Providing information on pancreatic cancer is crucially important all over the world, since still many people die of this cruel disease. Around 9 pm we went back to the hotel. After some inspiring conversations with other participants, we went to bed. On the next day our agenda was packed, but before kicking off the first sessions, we received another very warm welcome: Every attendee received a nice meeting goodie bag, which contained a notebook, a pen, a bath towel and some other stuff and drinks. Of course, all things were branded in our purple color! Finally, the day started with a range of different presentations, most of which focused on the topic of fundraising and revolved around questions like “How do I raise money for my organization?”, “How can I get financial support for implementing my ideas?” or “Who may be able to support us?”. When you hear with what kinds of funds larger groups in the US or other countries are dealing with, you are likely to start feeling a bit overwhelmed and dizzy from a German perspective. The day closed with a joint dinner at 9pm. On Thursday the main topic on the agenda was the fourth World Pancreatic Cancer Day in November. In different workshops we discussed new ideas and also agreed on the overarching umbrella theme for this year’s event. All in all, representatives of more than 40 patient groups exchanged their views on how the global awareness day could be organized in an optimal way. It is important to say that there was a strong consensus among all attendees on particularly one aspect: We all agreed that the annual World Pancreatic Cancer Day is one of the most important activities which we developed and initiated together so far in order to educate the general public worldwide on this disease. On the same evening, we were invited to a special dinner in one of the oldest restaurants in town, which started around 5.30pm. We enjoyed the marvelous food and great conversations and the day ended in relaxed atmosphere. Before we all left, the meeting organizers again warmly thanked us for the productive cooperation and for making the trip to Montreal, which made us very happy and feeling valued. Around 9pm we were back at our hotel. Although we were totally exhausted, falling asleep was not easy for us, because we were still struggling with jetlag. The following day was departure day already. Before going to the airport for our return flight, we originally had planned to do some more sightseeing in Montreal. But local weather thwarted our plans, since it rained cats and dogs. Therefore, we decided to visit a basilica instead, which ultimately turned out to be a great idea. Afterwards we took a cab to the airport and waited for our flight home. After a long journey we arrived in Frankfurt around 8am the following morning. By train we travelled from Frankfurt to Stuttgart, where we were welcomed by our partners. During dinner, which we enjoyed together, we told them everything about our trip and the things we had seen and done in Montreal. My bottom line after a very exciting and eventful week in Montreal: We had a wonderful time in Canada. It was challenging, but extremely interesting and worthwhile. Dr. Steinbeck, who has been second chairwoman at TEB e. V. for ten years, provided a wealth of knowledge and also brought many ideas and own experiences to the table during the meeting, which was great. Thank you! I am very proud that TEB e. V. Selbsthilfe is a member of the coalition and that we were able to join and actively participate in the meeting representing Germany. TEB e. V. Selbsthilfe war aus organisatorischen Gründen diesmal leider nicht vor Ort dabei, war aber bei der Vorbereitung und Planung für dieses Treffen voll eingebunden und unterstützt damit die Arbeit und die verfolgten Ziele, den Welt-Pankreaskrebstag für alle zu einem wichtigen Tag weltweit werden zu lassen. 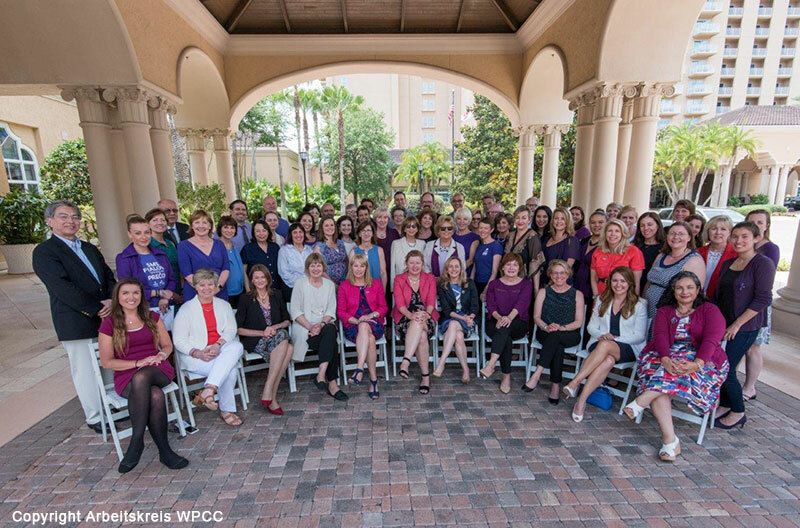 Now it’s official: The founding meeting of the World Pancreatic Cancer Coalition in Orlando, Florida /USA on May 11th. 2016 ensured the continuation of the group work under a new name. The union of 54 non-governmental organisations and patient advocacy groups, who are all working to beat pancreatic cancer, arose from the work of an international group. T.E.B. e.V. has been an active member of this group since 2014. The goal: To generate more attention to the topic of pancreatic cancer using our combined efforts and resources, to campaign for the affected people and to encourage research into this illness, for this type of cancer is one of the few which still have a high mortality rate. During the two-day meeting, the ground-work was done and goals for the future work together were defined. One of the main tasks of the newly founded coalition will be the comprehensive planning and steering of activities on the occasion of World Pancreatic Cancer Day, which occurs annually. This year it takes place on November 17th. 2016. Several possible events and various ideas were discussed. The official website of the coalition as well as the new logo were presented. The logo consists of two purple ribbons which form a globe and symbolise movement, change and working together. Apart from that, different aspects which concern the internal organisation of the fusion of patient advocacy groups were discussed. On July 1st. 2016 the present acting board with chairwoman Julie Fleshman will either be replaced or confirmed – together with additional members. Furthermore, it was agreed that the groups would work closely together to coordinate and synchronise future projects and a yearly meeting was also agreed upon. WPCC will be working on the planning of the World Pancreatic Cancer Day over the summer months and the implementation of events. Anyone interested in supporting the World Pancreatic Cancer Day or taking part in it is welcome to contact TEB e.V. under the following e-mail address: geschaeftsstellezMxH7gT8iPxQs9vTwQmVxZy5rTfXteb-selbsthilfe.de">geschaeftsstellezMxH7gT8iPxQs9vTwQmVxZy5rTfXteb-selbsthilfe.de. You will find more information about World Pancreatic Cancer Day on: www.worldpancreaticcancerday.org. 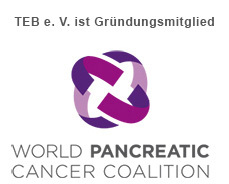 Information about pancreatic cancer, World Pancreatic Cancer Coalition and its members can be accessed on www.worldpancreaticcancercoalition.org. You can follow WPCC on Facebook under: World Pancreatic Cancer Coalition, on Twitter under ‘WPCC and on Instagram. For the first time, an international working committee of patient groups gathered in Geneva, and later in Zurich, in order to discuss and share insights regarding the situation of patients with pancreatic cancer in different countries all over the globe. TEB e. V. has already been a member of this international working group, formed by patient group representatives, since 2013. The group focuses on the situation of patients who have been diagnosed with and are suffering from pancreatic cancer. The international platform is supported by Celgene. TEB e.V. 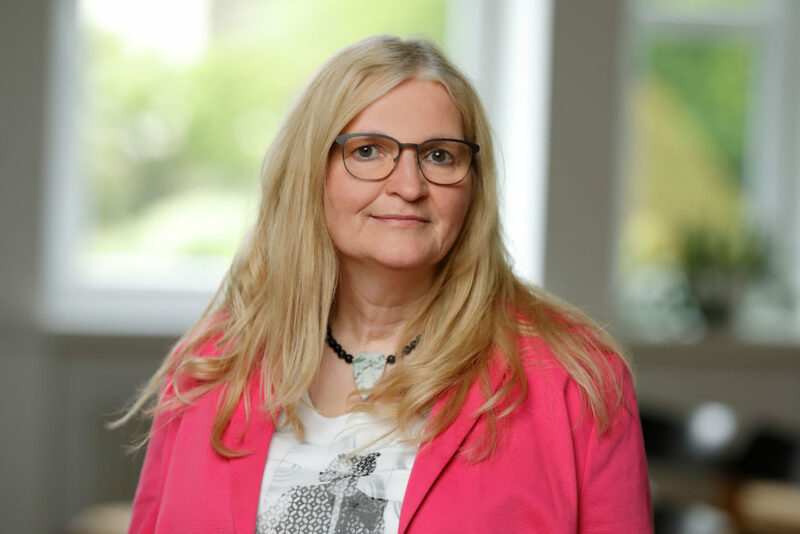 is represented by its chairwoman Katharina Stang. Patient support groups from Europe, Canada and the United States actively participate in this initiative. Apart from representatives of self-help groups, also expert speakers from the medical community and the political arena were invited to attend the meetings and talk about the current health care situation of patients with pancreatic cancer. Already during the first meeting, it became evident that further efforts are urgently needed with regard to research focused on improving the understanding of the disease as well as developing additional therapy options. Currently, prognosis for most patients is very poor, while all over the globe the incidence of pancreatic cancer is significantly rising. That is why this kind of international exchange and knowledge sharing is so important for us. Representing TEB e.V. during those meetings, we were able to provide input based on our daily experience with patients, families and caregivers from Germany. The main focus of our counselling has always been the search for new opportunities to improve the health care situation of patients from the perspective of a patient support group. Apart from that, options for an improved management of patients and their relatives also played a crucial role. TEB e.V. has considerable experience and expertise in these areas and we are very happy about the chance to bring those to the table in order to support other patient groups with conducting their daily work – especially those, which are not exclusively specialized on the pancreas. 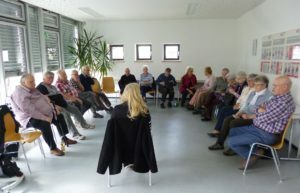 In Europe, there are only few countries with dedicated patient support groups that specifically focus on pancreatic diseases: among others, this is the case in Germany, UK, the Netherlands as well as Switzerland. TEB e.V. has a clear vision of quality of life when it comes to patients suffering from pancreatic cancer. This can either refer to the strong determination to try and get everything that is possible at all costs, or the step to accept one’s own fate and live the last life phase in dignity. As TEB e.V. is taking care of the patients from the initial diagnosis to the end, we are familiar with the issues and aspects that are relevant for the patients and are able to provide input and recommendations how especially these last months of life can be improved and facilitated for those being affected. On the occasion of the meeting we also had the chance to present our second recipe book. It was very well received and we were also asked to translate it into English. We are very happy to share our expertise and will provide the book to the UK group, as soon as we have finalized our search for a project sponsor. In addition, we were able to provide the impetus for another project that will presumably be kicked off during the next weeks and which we can hopefully also make available to other patients afterwards. It really felt very good for us to see that our work is so much appreciated at an international level. All in all, this working group demonstrated again very clearly that there is still a lot to do – in order not to only improve the quality of life but also, in particular, the prognosis of the patients. My thanks go to Celgene, the company which has been enabling this working group and which brought together experts from different countries. In my function as TEB’s chairwoman, I was happy to be accompanied by Dr. Steinbeck and Mr. Bibow and also would like to thank the two translators, who provided support and assistance.